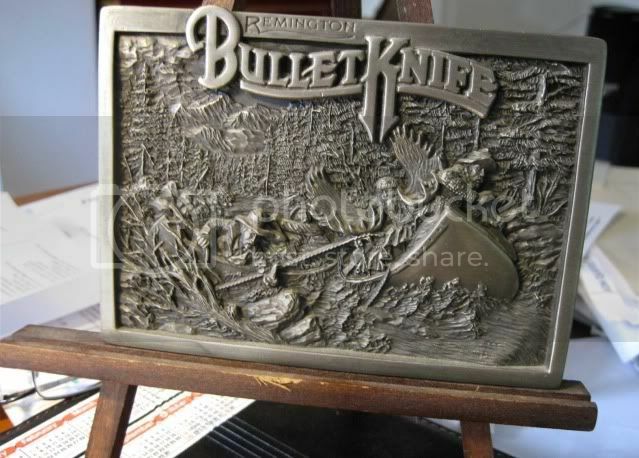 In 1982 or so, while working at a large Remington wholesaler, I requested a special roughly 4x6 pewter plate casting of the Duke 1982 Bullet Knife poster. We were going to produce & sell them. For one reason or another the project never was completed and I was left with what I was told was one of the two castings that were made. It was displayed on a small easel. I am wondering if they were ever produced or if folks have ever seen them. I could post a photo if there is interest. Yes I would like to see a photo, I'm sure there are others who would like to see it also. I'm not sure just what it is so can't say I've seen one! If my memory is correct, I believe they made a belt buckle like this, but only about 2"x3". I've never seen one this size. Right. That is my understanding. I think there were 2 made like this. WhileI was at this wholesaler, I also saved all of the Remington product posters. the Rem knives took a big dip in value. are they coming back or is it just my imagination? and I do have quite a few. I think it's just supply and demand. Remington and Smoky have been cranking out large quantites and many variations. Different blade and haft materials. I think the limited editions might be holding value, but if everyone that wants one has one, there goes the value. Just take a look on eBay to see what people are asking for some of the older ones are .